I’ve been itching to have a go again at Alphonsus for some time. Along with its two buddies, Arzachel (to left) and Ptolemaeus (at right), this trio are a time line of Lunar history. Ptolemaeus is the oldest. The crater floor is totally flooded, even the central peak is covered. It was fromed when the Moon was still very hot and lava readily flowed with a large impact. Arzachel is the youngest. The crater floor is intact with no flooding, the crater walls are terraced with land slides both inside and outside of the crater. Alphonsus sits bewteen the two in age. The crater floor is only partially flooded with the central peak still visible. 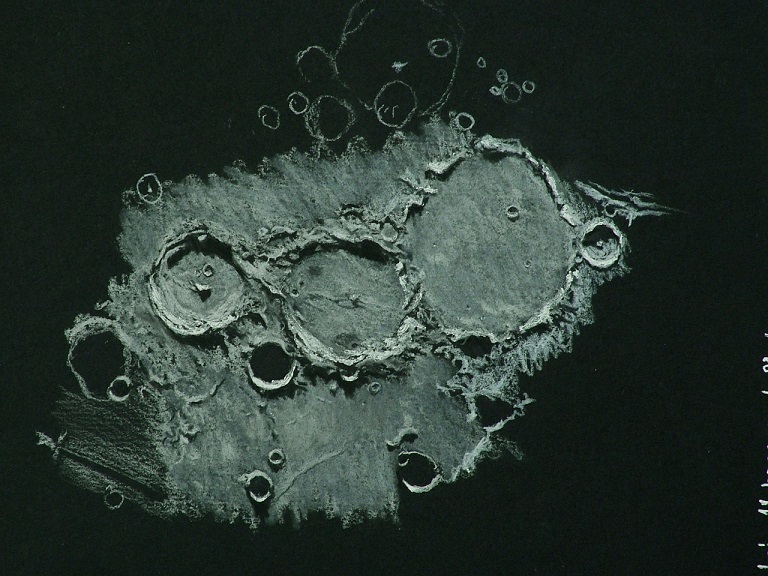 The Moon has cooled since Ptolemaeus and lava flow has slowed. BUT, volcanic activity was still occuring after the flooding process had stopped. This is seen from the pyroclastic deposits that sit within Alphonsus. 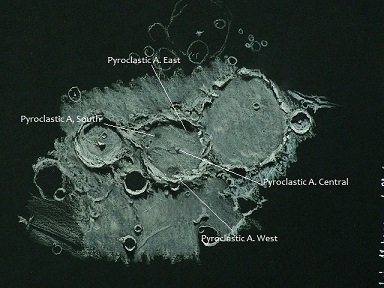 Four deposits lie within this crater and are marked in the labelled pic, and are seen as the darker shaded areas that are easy to see through the eyepiece. Quite remarkable to consider that from here on Earth we can see the effects of ancient volcanism on a body that isn’t Earth. Another treasure of the night was the Celestron Ultima LX 8mm eyepiece I used. These eyepiece are much underrated, but are surprisingly good. The 8mm in particular is easy to use for extended viewing. It made the 2.5 hours much more bearable, and my eyes were not as fatigued as they have been after with other sketches that have taken less time to do. It’s one of my favourite eyepieces. In a full screen seems to be with mi eye glued to the eyepiece. Your sketches betray your superb talent for sketching. Deep sky shallow sky you are a master of it all. Wow Alex, that is stunning work! Those features come alive in your sketch with great depth. I feel I am hovering above looking out the window of a spacecraft.